After making the decision that I needed some juice in my life it was time to pick a juicer. Like any good greensypants would, I took to the net and spent days and days researching juicing, juicers, what to juice, how to juice, juice recipes, etc. Oh yes, this is going to be amazing. Centrifugal: Uses a grater (think cheese grater) that rapidly spins and shreds the fruits and vegetables. Then, the shredded ingredients fall into a fast spinning basket that tosses the juice out the sides through a strainer and then drains down and out the front spout. The pulp remains in a removable basket in the machine. 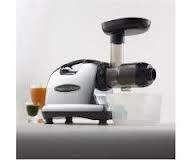 Masticating: Also known as a “slow” juicer, squeezes fruit and vegetables down an auger like a corkscrew. It squeezes more and more as the contents constrict. The juice flows out the bottom into a container and the pulp gets pushed out an opening at the end of the auger into a small bucket. Let’s talk about pros and cons. 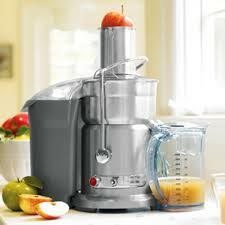 While a centrifugal juicer is generally the least expensive, you are sacrificing a few things. First, the friction caused by the rapid movement of the grating screen generates heat and also exposes the plant cells to oxygen. 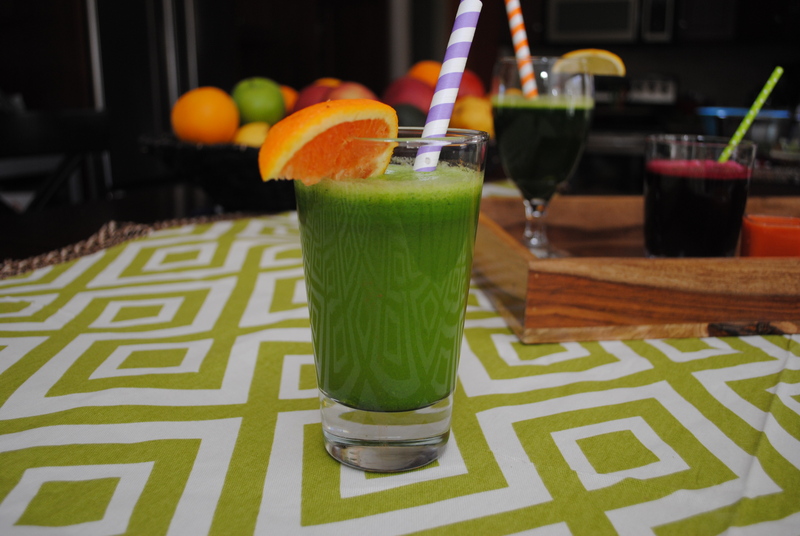 The heat and oxygen exposure will destroy some of the enzymes and nutrients in the juice. This isn’t ideal, but if you drink your juice right then and there after juicing you are still getting amazing benefits. Second, the pulp, which is the fiber left over after juice is extracted, will still have a fair amount of moisture in it. You can always do a second pass with the pulp to see if you can get any more. Users also report that they aren’t as good at juicing leafy greens, which are the bomb diggity and essential to “green” juice. Some advantages to a centrifugal juicer are that it takes up slightly less space than some masticating juicers. Many also have a nice, large chute which avoids having to chop anything first. Some can even fit a whole apple. It also juices pretty quickly and is relatively easy to clean. The centrifugal juicers that are most popular and have the best reviews are the Breville Juice Fountain Elite (for large volume juicing) and the Breville Fountain Compact (only small amounts of juice at a time). They cost $299 and $99 respectively. I really love the idea of the compact at $99. This is a great option for the average person who wants to get the benefits of juicing on a small scale and not spend a ton. There are plenty of other centrifugal juicers out there that are less expensive. I can’t in good conscience recommend them since reviews for them aren’t glowing. With the masticating juicer, the pulp will be more dry than with the centrifugal juicer. It’s like it put on spanx for a night out. It reeeaaaaaalllllly squeezes. It’s also really good at juicing those magnificent leafies and wheat grass. The juice will maintain nutrition longer than juice from a centrifugal juicer. This is because the action of the slow squeezing gently tears open the cells and lets the juice flow out without much oxidation and doesn’t generate any heat. Also, the masticating juicer does more than just juice. Some of them can extrude pasta, make nut butter and nut milk. Nifty. I chose the masticating juicer. I knew that in addition to my daily juicing, I planned to do occasional juice fasts and wanted the most nutrition I could get. I also like that I can make my afternoon juice and then have the leftover in the morning knowing it still has all the benefits it did the night before. I have the Omega J8006. You can look here for the least expensive price I could find at $279. Be sure to check out other places since prices seem to change daily. 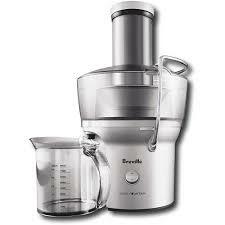 You’ll notice the price is actually better than the large capacity Breville. There are now newer models (the 8007,8008) that cost a bit more but the 8006 works great and you can get it for less. Getting the older model is a great way to get a masticating juicer but pay the same as you would for a high quality centrifugal. Omega made a big change to the J8006 and improved the auger so I wouldn’t buy a model that came before that. This juicer is available in a vertical design as well as standard design. The vertical is a bit more expensive but will take up less counter space. The bottom line…If you think you will be a casual juice drinker and you will drink your juice immediately after extracting, a centrifugal juicer is a good choice. If you are a little more committed and plan to juice more often and want it to last up to a day for drinking later, a masticating juicer is the best choice. Also, masticating is a must if you want to make nut butters or nut milks or use your juicer for pasta extruding. Make sure you check model capability for those extras. If you missed the post “Getting’ Juicy With It” make sure you give that a peek for some juicy inspiration! Are you enjoying greensypants?? Be sure to like greensypants on Facebook and follow on twitter! Share with your friends and tell me what we should talk about next!